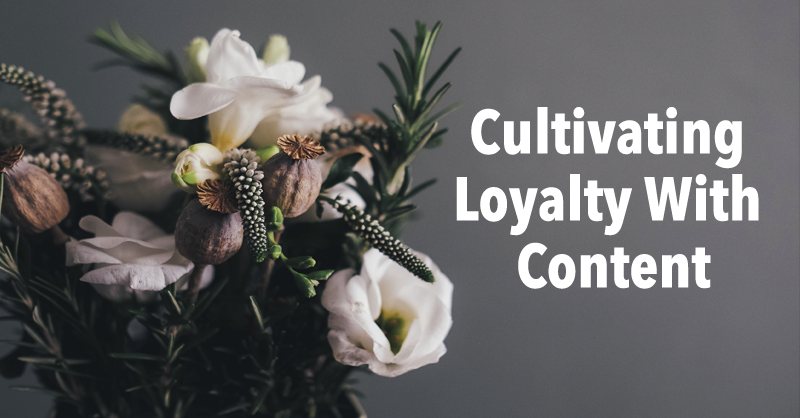 Producing dynamic content that supports your customers by solving their problems, catering to their interests and keeping them informed is a highly effective way of maintaining their loyalty. It feels like the emphasis of the media, marketing talking heads and even your boss today is always centered around growing a business. I’ve fallen into this trap before too. Every brand needs to continue to transform and innovate to thrive, but you can’t neglect the customers you’ve already got or you’ll quickly start to lose them. In marketing speak this is referred to as churn, the number of customers you’ve lost in a given period of time. The goal is to keep that number as low as possible, which won’t happen if you’re not continuing to engage and excite your audience as you once did to convert them in the first place. One of the most effective to reach and retain your customers is by consistently publishing worthwhile content. “So many marketers think of content as a one-and-done tactic, with short-term goals. But the best way to build deep and lasting customer relationships is to have a long-term mindset when it comes to content,” according to Melanie Deziel, a leading brand content consultant and speaker. “If you have a piece of content that worked particularly well, you can create a follow-up piece, showing more or updated information on the same subject or approaching it from a new angle,” added Deziel. “This increases the trust they have in you and the likelihood that they’ll follow, subscribe or bookmark your content to keep receiving more of what they already know they like and value,” she added. Here’s how to create content that reaches your audience again, reinvigorates them once they’ve consumed it and maintains their interest for the long-term. To re-engage customers with content again, provide them with useful information on subjects relevant to their particular needs — which will be different than what was served to them in the past before they became a customer. Topic-choice is very important here as the content shouldn’t be the same as what they’ve viewed from your company previously as its goal was to establish credibility and eventually influence a person to become a customer. 1. To ensure a customer continues to use your offerings: Explain the various ways to best use your products or services to complete a particular task. 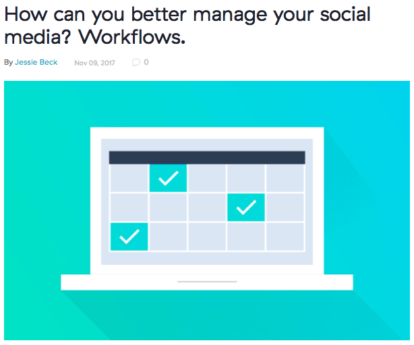 Example: This article from Asana, the project management software company, describes how their product can help a business manage their social media campaigns. 2. To drive further action like a purchase, upgrade, subscription renewal or a referral: Demonstrate how customers can maximize their existing investment by highlighting different examples of customer success or opportunities worth exploring in their industry. Example: This resources section of CBRE’s website provides customers with detailed recommendations including statistics, charts and maps about the real estate conditions in different markets for future office or retail investments. 3. To advance the understanding of your customers, their challenges and the marketplace: Offer opportunities to survey your audience on a particular topic on a small scale like a one-on-one interview or on a larger scale by asking for comments or feedback on an article, survey or video. 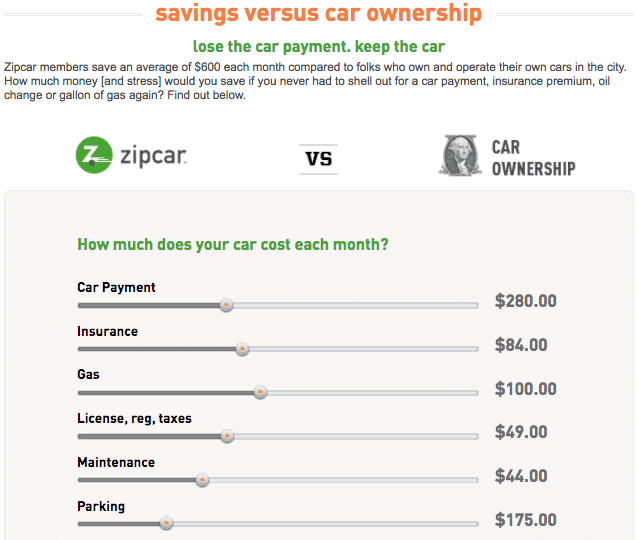 Example: Zipcar has a survey on their website to help customers determine the cost savings of using their services versus car ownership or renting a car, which is an opportunity for the company to gather data about potential and existing customers. Next, choose the right delivery method to ensure this content actually reaches your customer base. You’ve likely got data about your customer’s demographics, preferences, behaviors and purchasing history and a direct method of communicating with them. Use this access and data to make more informed decisions regarding distributing your customer-focused content. The most likely channel for reaching customers is through a specific email list, which can be used to alert them to where to find a new webinar, white paper, podcast episode or another form of content. There are distribution channels, such as a blog, that’ll likely include content relevant to new, existing and potential customers, which is completely fine, just don’t inundate an existing customer with irrelevant content meant to court a new prospect. 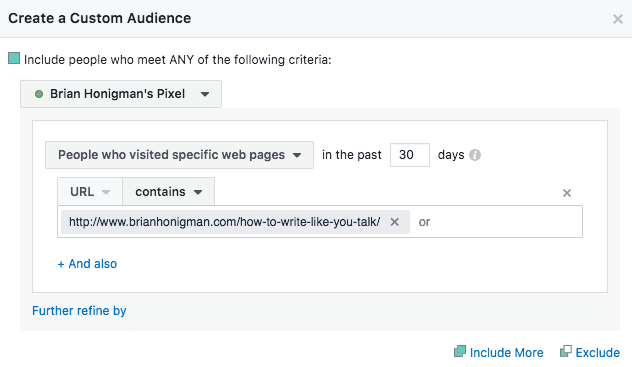 Another helpful tactic for re-engaging customers with content is by targeting your Facebook ads with custom audiences. Beyond bulk uploading customer emails and phone numbers to reach them on Facebook, spend time instead on targeting customers that have interacted with specific content on your website, Facebook or Instagram. This way you’re able to advertise new information to them based on the content they’ve viewed and expressed interest in before, which is far more likely to be effective at resonating with them again. Create custom audiences that target Facebook ads to people that have visited certain pages on your website like a blog post, landing page or another type of content. 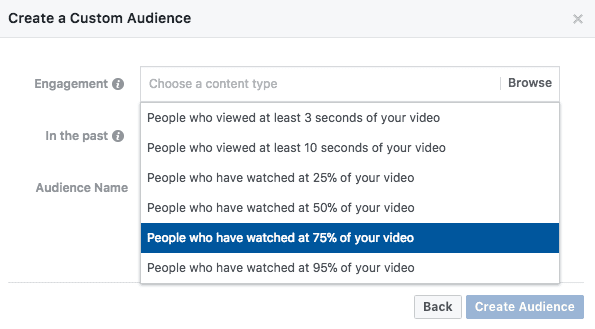 Another option worth exploring is reaching people that have watched a certain percentage of a video you’ve shared on Facebook, illustrating their interest in that topic by how long they’ve watched it. The goal is to serve new, engaging and relevant content in your ads to people that are most likely to find it useful based on the interactions they’ve had with similar content of yours in the past. Once you’ve reached your audience again, it’s time to invigorate them with one-of-a-kind information that reminds them why your company’s offerings are distinctly useful over the other available options. Simply put – this is an opportunity to provide deeper insights on solving the challenges your customer base faces and offering it exclusively to them. Going deeper with content means that you’re tackling complex subjects and offering high-quality, timely and actionable information on how to manage these issues. This could be an in-depth 45-minute webinar, a three-page white paper, a four-minute video or even a comprehensive email. Often this content is lengthy as it typically addresses nuanced subject matter which requires a thorough explanation. But don’t go long-form for the sake of it, only if the topic requires it. The point here is to make a customer’s life easier and if relevant, help them succeed at their job. If you’re searching for an example of this type of content filled to the brim with ah-ha moments than look no further than Marie Forleo’s YouTube series MarieTV. 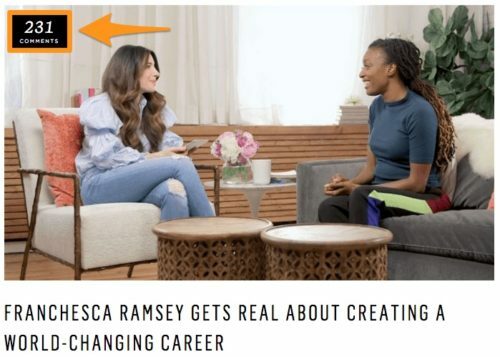 As an entrepreneur, business expert and the founder of B School, Marie Forleo regularly publishes how-to style videos that provide deep dives into challenges current and future business owners face like how to say no to an opportunity or how to become a better writer. Even though the series reaches a vast audience of over 400,000 subscribers, it feels like an intimate one-on-one conversation with Forleo’s dynamic personality and keen business insights shining through. Each video is consistently an in-depth conversation on how to succeed as an entrepreneur, going beyond the surface level answer to a particular question. The questions featured come from customers and fans asking about the problems they’re up against in their own businesses. Whether an episode is five minutes or an hour long, each video provides the proper context about a particular business or career issue and then offers original advice, infused with humor, around the different options for actually solving the problem. Various examples are included from other companies or based on Forleo’s experience to showcase what each step may look like when executed. Viewers are prompted to comment about the video on Forleo’s blog, which often leads to hundreds of comments discussing the subject and a continued exchanged of support and education on the topic. The series provides advice that’s original, relevant to the audience and communicated in a conversational manner. It simplifies the complex to make it far more palatable. The information is high-quality and well researched to include opposing viewpoints, related statistics and the opinions of subject-matter experts making each video more useful for viewers. What can’t be duplicated is Forleo’s engaging personality on-screen, which is one of the many reasons the series resonates. Instead, experiment with different ways of including a human touch throughout your content. Each video spurs a discussion from Forleo’s community of viewers, which reinforces and adds an additional layer of value and support from her content. The series has been published for over six years, illustrating how consistency around content creation can go along way towards building trust and keeping customers excited. Apply these lessons from MarieTV to develop content that moves beyond the expectations of your customers. 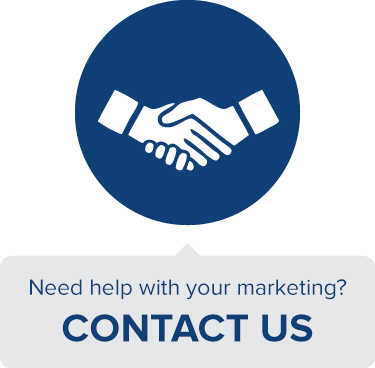 Being a reliable source on a specific subject area consistently is how an organization can retain its customers for the long-term. Companies often spread themselves thinly across too many different content efforts, narrow in on a singular focus that isn’t a match for their audience or give up on content too quickly. Consistency around how often content is produced, the focus of the content and the way in which the content is formatted is usually what’s missing. Developing a consistent series makes it easier to regularly create new pieces of content as much of the foundational work is done up front, leaving room to perfect each installment. Long-term consistency with content that drives trust and loyalty requires discipline, creative thinking and above all, ongoing analysis. Discipline – Creating content on a daily, weekly or monthly basis is certainly a commitment of time, resources and energy. There will be moments when it’s exciting to publish customer content and other moments will be extremely challenging, often leading to an urge to quit. Discipline is a required part of the process to make sure you’re able to regularly execute against your content goals for the long haul. Create easy-to-follow systems to make repetitive parts of the process more streamlined to reserve your energy for more difficult tasks. 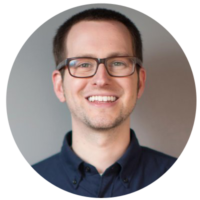 Don’t overcomplicate your approach to content, but instead keep the workflow simple at first and then add more complexity over time as the team gets more comfortable. Creative Thinking – Keeping customers interested in what you’re publishing comes down to covering a range of topics that fall under a single subject area. This way it’s easier for an audience to remember what expertise an organization is known for, making them more likely to reference this content again in the future. Creative thinking is a required skillset when creating content because you’ll consistently need to come up with new, impactful topics to cover that fit within a specific focus area. 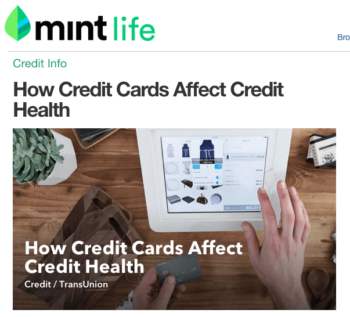 For instance, on the Mint company blog, they’ve covered a range of topics like how credit cards affect your credit health to home-buying tips for millennials. Each of these topics is distinct but related to Mint’s overall focus on producing personal finance-related content as it connects back to their product offerings. Reference the diverse range of topics covered on their blog since 2006 to see how they all tie-back to a singular focus. Mint’s approach to content is a prime example of creative thinking in action. Ongoing Analysis – While it is important to not quit too early with content, it is certainly necessary at times to make changes to your approach. Ongoing analysis is required to adapt the way content is produced and distributed to ensure it remains a viable method of cultivating loyalty for the long-term. Monitoring results with content will highlight what’s working and what’s no longer driving success. These changes can be small like altering the way you’re choosing titles for videos to more substantial changes like repurposing blog posts into podcast episodes each week. From the beginning, establish what metrics align with your content goals and review your progress to inform what should change and what should stay the same. In the comments, share what company’s content you’ve consistently enjoyed or educated you on a subject more than once. Be sure to explain why it resonated with you.